We will have our telescopes set up for you to observe the Moon, any visible planets, and other objects of interest in the night sky. We can teach you about the constellations and how to recognise them, and answer any questions you may have about astronomy or telescopes. Even if it’s cloudy we will still be on site to answer questions, ever hopeful of a break in the clouds, but viewing may be limited. In the event of rain or severe weather, sessions will be cancelled. Please follow our Facebook and Twitter feeds for information as to whether the event will go ahead, or call the park on 01376 347134. We aim to post updates on the day, around mid-morning for solar gazing and mid-afternoon for star gazing. This event is free but car park charges apply. The event is suitable for all ages (children must be accompanied by an adult). We can be found somewhere in the vicinity of the main building, near the Sky Ropes for star gazing and in the field to left of the main path for solar gazing (we have a sign pointing to where we are. Also if you already own a telescope and need help with it, you are welcome to bring it along and we will try to assist you BUT only where possible if any of our volunteers are available – on busy nights this is not always possible. Please note that if you do bring your own telescope, it is entirely your own responsibility and you will need to be able to carry your telescope from the public car park. We are unable to assist with transporting your equipment to the observing site. 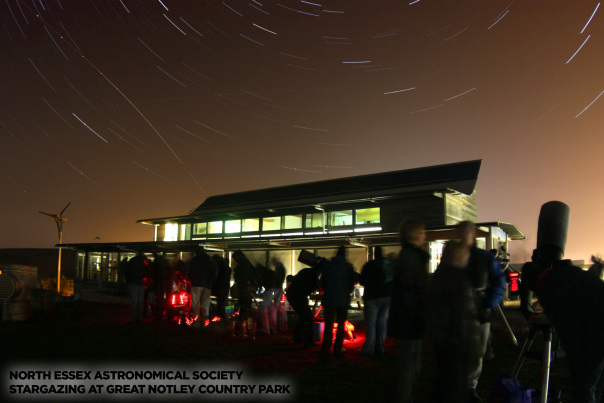 Only NEAS members are covered by public liability insurance at our events, so please be aware of this before letting other members of the public use your telescope. Please park in the public car park. The site is off limits to cars while the event is active, and only NEAS volunteers have the park’s permission to park on site due to Health & Safety reasons. Please keep dogs on short leads near the telescopes. Our members may use safe laser pointers to show you things in the sky, but members of the public are not permitted to bring laser pointers to our events. If you are seen using a laser pointer you will be asked to return it to your vehicle or leave the event. We understand that you may be using a torch to walk across the park but please keep the light shining downwards at all times. No flash photography unless you want to see grumpy astronomers. Please see our Great Notley Event page for directions and other important information.